1 7/8" x 1 5/16"
The simple yet elegant design of this Hoffmaster 610020 white fluted baking cup not only provides you with an attractive, sanitary way of displaying your pastries, but also boosts your efficiency by minimizing pan cleanup time! Perfect for muffins, cupcakes, miniature cheesecakes, or virtually any other confectionary creation you can conjure, these baking cups have excellent product release so your customers can cleanly enjoy every last bite. Great value for white baking cups. Perfect for when you want the cupcake or muffin to be the star and the liner to be neutral. We ordered these for our vegan bakery for the mini donuts we bake. They were a smidge small...our fault for not measuring accurately. We made them work! These baking liners fit perfectly into my 24 cup silicone cupcake pans. Great standard size. Good price for a basic cup. Can't go wrong with these. Great product at a great buy! Cupcakes alway come out great! Like that you can get 500 or 10000 to suit your own needs. Cheapest way to buy if shipping is not to expensive. 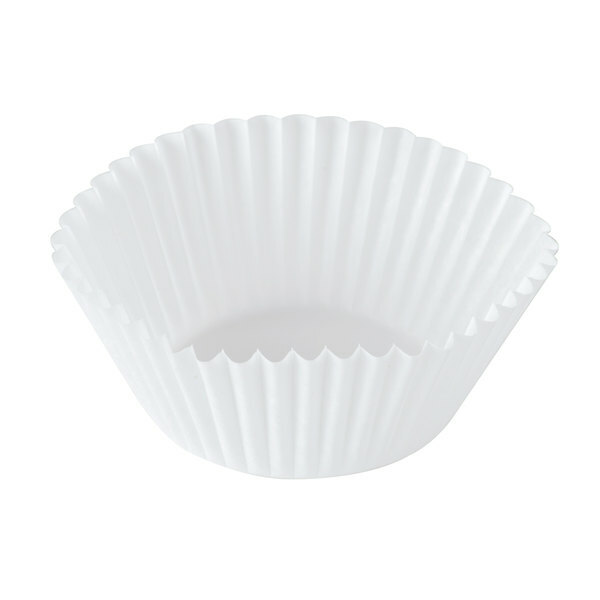 These are good quality liners and make standard size cupcakes. These liners are not grease resistent and do not stay a solid white color when dark batters are used. These are listed under the standard size muffin cups. I think they are a tad small compared to what you can get in the grocery stores for regular muffins. I don't like these for regular cupcakes, since they are too small, but I will use them for snacks and candy at parties. These liners are very mid quality and are not greaseproof, the type of liner than easily shows through the color of the item baked in it. There's nothing wrong with them, but nothing particularly special about them either. I am very pleased with the Hoffmaster white fluted baking cups. The quality is superb and the construction is sturdy. I used them at a wedding reception recently to hold various "sweet bites", as I call them. Excellent for portion control and much more sanitary than a bowl or platter, these cups made an attractive presentation at a very reasonable price. I highly recommend. These cupcake papers are a great value for the price and quantity received. They are just a basic wrapper, nothing fancy, but that is all that is really needed for most cupcakes and muffins.